Souza, with his infant son still cradled in his left arm, pulled out his pistol and fired back in retaliation. 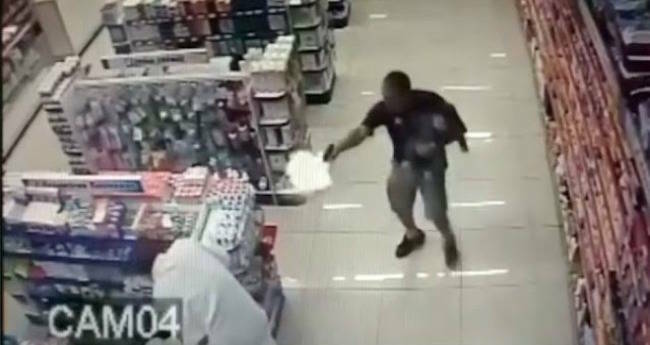 In surveillance footage from Sao Paolo, Brazil, an off-duty police officer engages in a shootout with an armed robber, all while his infant son is in his arms. This scene unfolded last Saturday afternoon, when armed robbers stormed a pharmacy in the city of Campo Limpo Paulista, São Paulo, Brazil, reported Portal Ligação News. Unfortunately for the would-be-robbers, that afternoon Military Police Sergeant Rafael Souza was shopping at the pharmacy with his wife and infant child. Souza’s wife was talking with the clerk when the two men came through the door with guns drawn and announced that they were robbing the establishment. According to reports, one of the robbers, Jefferson Alves, 24, a resident of Campo Limpo, then pointed his gun at Souza. Souza, with his infant son still cradled in his left arm, pulled out his pistol and fired back in retaliation, killing Alves. He then shot the second burglar, Italo Creato, 22, a resident of Várzea Paulista, killing him as well. It is only after shooting both men that Souza passes his child to his wife, who was ducking between the aisles of the pharmacy, avoiding gunfire. Souza told investigators that he shot at the robbers because he believed they would have opened fire first if he had identified himself as a police officer. After the events of the video, a medical team from Campo Limpo Paulista appeared at the scene, but the two assailants were already dead. The footage and weapons found at the scene are being investigated by police. Next, read how a woman killed 15 of her in-laws in a failed attempt to poison her husband. Then, read how a humongous, 700-pound emerald was found in a Brazilian mine.